So how it works is the bride and groom write a letter to the other a few weeks before their wedding. They share their thoughts about the qualities in their partner, the reasons for falling in love, their hopes and dreams and what they think might need to be said when their relationship is tough. During the ceremony they each have a timber box with a fabulous bottle of wine in it and then place the letter in with the wine, nail it shut and pass the sealed box to their partner. 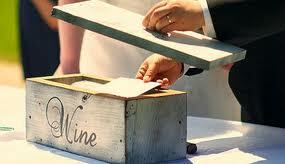 Either have separate boxs (then there is two bottles of wine) or one box with wine and both letters. By acknowledging that your marriage may have up’s and down’s but you are willing to sit down open the wine, read the letters and talk is a good place to start. Other ideas to include could be a CD of your favourite music or favourite pictures of you together. You could also incorporate other family members or children. I’ve got a couple that will have a 2 and a half year old by their wedding day and they are going to get their small person to draw a picture to go in the box. There are many way that you could put a spin on this idea. Could also keep the box to open on a special anniversary. I think this would be a lovely addition to a ceremony. I’d love to hear if you have another non-traditional commitment idea. What are you thinking about including in your ceremony?